Sir-Tech is best known for their Wizardry series of RPGs, but they did produce a couple of pure adventure games as well, though these are fairly scarce in comparison. 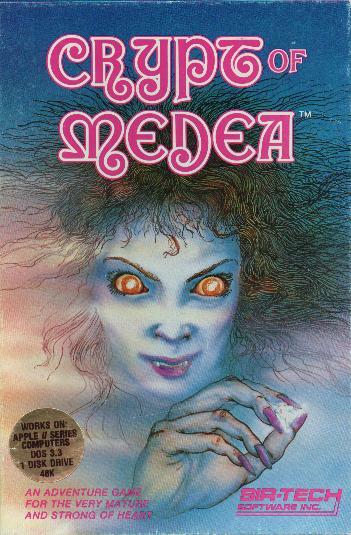 Crypt of Medea is a horror game, with a lot of shock value for its time and a warning label recommending it for mature players only (though it's tame now when you look at, say, Resident Evil or Postal). The goal is simply to escape said Crypt. Lots of do-or-die puzzles, not much plot. Penguin Software's Graphics Magician was used to create the static pictures. One of a scant few Apple II titles to offer Mockingboard support.